Ensuring that your commercial building runs safely and without power outages can be hard work, but upholding preventative maintenance is imperative. Start with an infrared scan of your electrical system to ensure that you aren’t blind to an accident that’s waiting to happen. Infrared scanning gets its name from the infrared camera and related equipment that are used to scan your building’s electrical components and distribution system. You can use it to identify hidden problems, such as overheating components, and take proactive steps to prevent costly and sometimes dangerous electrical outages. Understanding infrared scanning—and how to get the most of it—will help you meet the requirements established by the National Fire Protection Association for a predictive maintenance program that’s performed on a routine basis. Infrared scanning will give you an inside look at your building’s electrical system—the good, the bad and the ugly. It also will help you stop a small problem from turning into a breakdown in your other systems, including your communication, fire safety, security and other mechanical systems. All too often this is a hidden problem, and it can also be a silent one. Experts say that weak or at-risk components in electrical systems can go undetected for months or even years. In electrical systems, increased heat and resistance can be caused by component age, fatigue, oxidation, wear, loose connections or poor installation. Even new components can be defective. Something as simple as a loose screw on a breaker can cause a hot connection. Because most things electrical tend to get hot before they fail, infrared inspection is the preferred diagnostic technology used to detect early failures in electrical systems and switchgear. On a typical infrared scanning procedure, a technician generates a list of all electrical (and mechanical) equipment to be inspected. Getting familiar with the building will allow the technician to inspect and record the condition of equipment faster and more accurately. Typical equipment to be checked include panel boards, fused switches, busways, motor control centers and transfer switches. Other equipment might include substation transformers, power circuit breakers and essential motors. A significant advantage is that all scan inspections are done while the equipment is energized, so that continuity of power is maintained. This also means your scan can be performed during business hours, with no disruption in service. At Interstate Electrical Services, we use a thermal scanner. The principle of operation is that operating electrical equipment gives off heat. This heat can be detected by a thermal camera that produces images in color showing variances in heat patterns. Basic components of the color system are the thermal-sensing camera and a portable, rechargeable battery pack. With just these two components, effective real-time detection of hot spots can easily be done. Getting the best possible thermal images means the doors and covers of the electrical components must be opened, exposing the inner workings of the system. Keep in mind that only a licensed electrician—not an infrared technician—can work on a live electrical system, according to NFPA 70E guidelines. The NFPA also requires the electrician to wear personal protection equipment. It takes a professional to conduct an infrared inspection, but you may encounter two kinds when you arrange a thermal scan. Each brings skills to the job, but they are different in important ways. An infrared technician, who is trained to use infrared imaging equipment, like a camera, can conduct the scan and capture the needed images. A licensed electrician, on the other hand, brings expertise and knowledge in long-term building systems care and applicable codes and standards. An electrician will also be knowledgeable in the nuances of older and newer technologies, retrofits, and lifecycle costs, and be sensitive to the overall goals of the facility such that they can help to prioritize any needs of these systems. In addition, if equipment must be opened to get a good scan, a licensed electrician has the expertise and appropriate PPE to ensure compliance with NFPA 70E safety regulations. Once the images have been collected, it takes a professional with substantial understanding of electrical principles and electrical systems, like an electrician or even better an electrical engineer to effectively read and analyze the resulting images. The process of diagnosing hot spots can be assisted if the scan also includes both voltage and amp readings to corroborate the visual findings. Being able to read the details is as important as highlighting the problem. Post scan, the images, notes and recommendations for any remedial action are detailed in a report. Included are all of the images collected whether or not they show a hotspot. These become the baseline and against which future readings can be compared to determine a pattern that should be addressed (filtering dust for example) and can help in establishing an electrical maintenance routine that may include tightening connections and cleaning components. One important recommendation is to avoid assigning infrared inspection to the facility’s own staff. They will tend to focus on what they are used to or what is in need of repair; therefore, they may lack the flexibility for change or global insight necessary in both short- and long-term cost-benefit solutions. Infrared scanning is a safe, non-evasive proactive method of detecting potential failures in your mission critical infrastructure before they cause an outage. 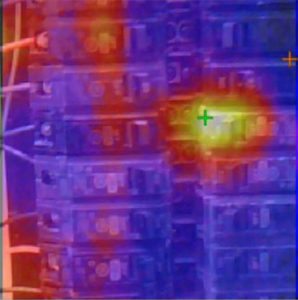 Few investments have the substantial ROI of an infrared electrical survey. If you have a new or remodeled commercial building, or are installing, upgrading or maintaining your commercial power system, feel free to give us a call and set up an electrical infrared scan. Make sure you are getting what you pay for, and that your building and systems are functioning according to specifications.